Our car has what is still called "standard" drive (because auto transmission is really a luxury item). I bought it in large part because manual-transmission cars are more fuel efficient, and have a significantly smaller price tag, than cars with automatic transmission. I confess freely: the other part is prejudice on my side. I grew up in a place where the only people driving an automatic transmission cars were either handicapped or elderly. I'm not ready to fit in those categories, even if the classification is entirely in my own head. There has been some grumbling on the part of CelloDad about that stick shift deal, but that's mostly because he learned to drive as an adult. In fact, I was the one who taught him to drive a stick, in a VW van with a very forgiving gear box. But he never did get to the point where shifting came naturally and without thinking. When we make the switch to an electric car, it will of course have no gear box. Until then, I am the family's designated driver. But the upshot is that our children get to learn to drive in our standard drive car. This is great because that way they will never get stuck or - embarrassed - if they are required to drive one. For instance, when they need to drive most anywhere outside the US. Starting out with a standard transmission can be a little hairy especially if they have been taking lessons with a driving school, which in the US has mostly automatic cars, unless you specifically request standard. I mean, suddenly the student driver has to deal with three pedals in that footwell. Then we did dry runs with the transmission. With the engine off, we went through the motions of shifting the gears, going through all of them several times, including reverse. We covered braking to a full stop - (which requires two feet, probably the part that's easiest to forget. Next, we went on an imaginary drive around the block. I talked us through the turns, the stop sign, the gear shifts, and even an emergency brake to avoid hitting an imaginary dog. My children, like all children, have lively imaginations so this trick works really well. At the end, we "parked" the car, backing it into the driveway in our heads, with me talking through the use of mirrors. And then we got out. The next day, we found a deserted parking lot (a church lot on a weekday). We switched placed and I handed the keys to my daughter. We went through a short dry run, and then she started the engine. A rush of excitement rippled through the car. When you first start to drive, getting the car to go where you want it takes a bit of practice. 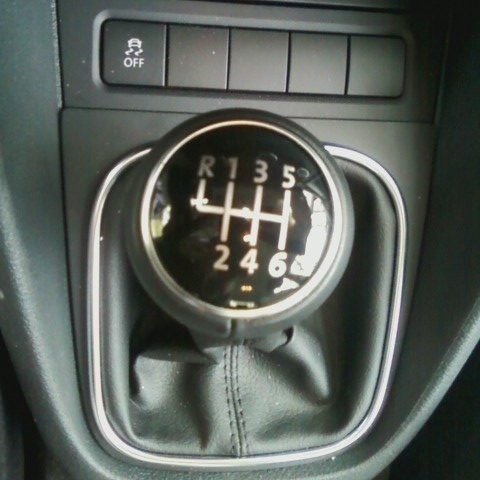 If you add that whole bit with the shift stick and the clutch pedal, it can be overwhelming at first. So we took it one step at a time: getting going in first gear, turning around the corner, and braking to a stop, with all the actions in sequence so she was dealing with one thing at any given time. This lot had an elongated island in the middle, and we crept around that several times, all in first gear, until she could do it smoothly, that is to say, without my head bobbing forwards and back. I have to say, I had an easier time on my first time, when my dad took me on a similarly deserted parking lot and handed the keys to me. It was a similarly sized car (also a Golf, in fact) but with a significantly smaller engine. It was a gasoline engine too, so it didn't have the kind of kick you get out of a turbodiesel. Nevertheless, I am proud to report that my daughter took to this four-limb experience with a natural ease. She only stalled a very few times through the many stops, starts, and gear changes. She was ready to hit the road, but we had been on that lot for 45 minutes and I could tell her left leg was getting tired. By then she had gotten the hang of the first and second gears, which are really the hardest: if you can handle that, you can deal with the higher gears. So our next drive was a quiet residential neighbourhood with relatively long stretches of straight road, where you can get into third gear. In a car with more than four gears finding that third gear is actually a little tricky, since it's somewhere between first and fifth, and you have to develop a feel for the right position. So yes, on a few occasions she put it in first gear instead of third, revved the engine, freaked out and stalled. Is why you do it in a quiet neighbourhood. Also, I had printed a "Student Driver" sign and another one that said, "If you can read this, you're too close!" and fixed them to a magnetic bumper sticker. I would take them out before our driving stints and stick them on the hatch to warn people. Those signs helped a lot - especially on the one or two adrenaline-laden occasions that she stalled in the middle of an intersection and it took a few tries to get going again. And so it went until one day were were on the highway, accelerating on the on ramp, and going through the whole range of gears. At this point she was ahead of CelloDad. When he finally came on a ride with us, he admired her smooth shifting without revving too loudly, and sheepishly admitted that he never uses the fifth and sixth gears, having learned to drive in a four-gear car. Looks like I've got another one to coach. 1. Drive like your life depends on it - it does.